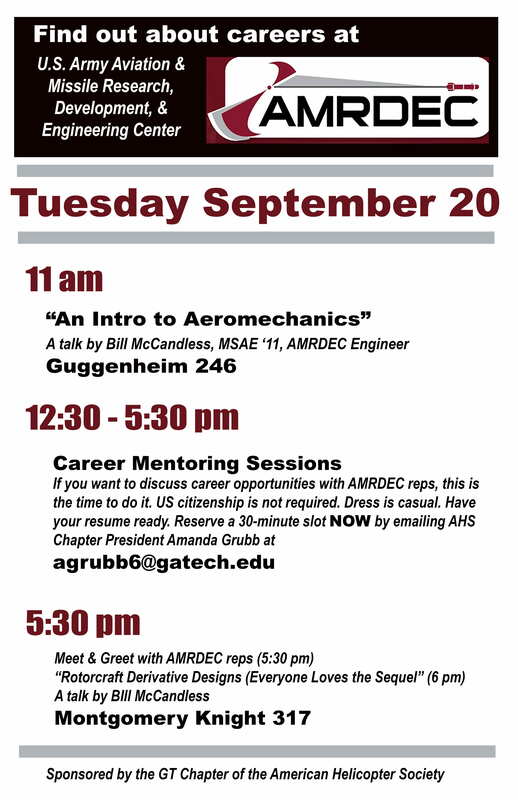 Bill McCandless from AMRDEC will be on campus on Tuesday September 20th for 2 presentations and career mentioring sessions. The first presentation “An introduction to Aeromechanics” will be held in Guggenheim 246 and the second presentation “Rotorcraft Derivative Design” will be held at 6pm in M-K 317, with a Meet and Greet with AMRDEC representatives before (5:30-6). During the afternoon, mentoring sessions will be held: make sure to contact AHS-GT chapter president Amanda Grubb at agrubb6@gatech.edu to reserve a time slot!